Director Nanni Moretti, best known to American audiences for 2001’s The Son’s Room, has hold of an intriguing subject with We Have A Pope, a gentle comedy about an obscure cardinal (Michel Piccoli) who, much to his bewilderment, emerges as a compromise candidate for the papacy. There’s only one problem: Piccoli’s character can’t make the psychological leap required for him to walk out on a balcony overlooking St. Peter’s Square and proclaim to the multitudes that he is indeed Il Papa. Instead, he goes through what appears to be an anxiety attack so massive that the desperate cardinals call in a psychiatrist (played by Moretti) to help the pope conquer his fears and ascend to the papal throne. Piccoli’s pope believes in God, but doesn’t seem to think that he possibly could have the authority to speak for his creator. At one point, he’s able to don civilian clothes and take to the streets of Rome, where we learn that he once aspired to be an actor. Left with nothing much to do inside the Vatican, Moretti’s character organizes a volleyball tournament among the restless cardinals. The press and public await word. Piccoli gives a sweet performance as a humble, doubt-riddled man of the cloth; he’s matched by Polish actor Jerzy Stuhr as a no-nonsense civilian charged with stage-managing the pope’s ascendance and with keeping the press at bay. In his role as writer and director, Moretti seems to have decided to work with a light touch. If he’s poking fun at the Church, he’s using a feather duster rather than a laser. I found myself wishing that Moretti had made a more serious and perhaps weightier drama about what it means for someone to step onto the world stage. But even in its serio-comic form, We Have a Pope provokes thought. It leaves us to wonder what might happen if someone refused to accept the lead in a global drama. 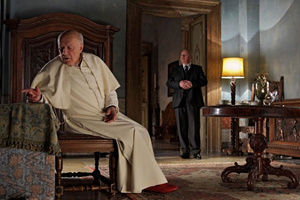 Piccoli’s pontiff once wanted to be an actor; the movie’s irony is that a twist of fate offers him the one role he doesn’t believe he can play.